As we announced this morning, we decided to share some items from our collection if there is interest (let us know in the comments if you want us to continue or if this bores you to tears). Lexington and Concord (Birthplaces of the American Revolution). Bill and I collect military firearms and we have a fair number of Smith and Wesson’s products. We don’t own any firearms associated with Lexington and Concord, yet, but we have visited the towns often. Some of the military firearms we own were made in the Springfield Armory. Here is the oldest one we own at this time (click on all pictures to enlarge). This is a Trapdoor Springfield. The armory’s Master Armorer, Erskine S. Allin, faced a problem. The Civil War proved that the muzzleloader’s day was over and yet the military owned too many muzzleloading rifles to just scrap them. Allin had to come up with a way to turn these weapons into breechloaders. He faced many problems, not least of which was the safety of the user. Like most good solutions, he came up with a compromise. 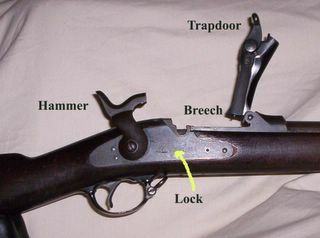 He sliced off the top of the breech of the muzzleloader (the part of the barrel where the cartridge sits before it is fired), and created a replacement piece (the eponymous trapdoor), that included a firing pin, hinge, a way to open the breech for loading and a way to securely seal it when firing. To load a soldier would unlock the trapdoor, swing it up, insert a cartridge, swing it down, and lock the action. The new breech used the same hammer to strike the firing pin when it once crushed a percussion cap. This meant the same lock (the part of an old-fashioned gun that includes the trigger and hammer assembly) could be used as well. Small changes to the wood stock also had to be made. Overall an elegant and cheap solution. The army loved it and chose to implement his design. They retrofitted thousands of guns, used up stores of old parts, and eventually built new ones on this model. We don’t know if our Trapdoor Springfield was ever used in the Civil War as a muzzleloader. It would be nice to know if it had been at Shiloh, the Wilderness, Gettysburg, but who knows. We do know it is a Model 1884 with a socket bayonet. There are other Model 1884s with a rod bayonet built into the gun. The firearm went through several models, about 14 of them although some of these, like the Model 1884, are really small changes that are hard to justify calling a model. 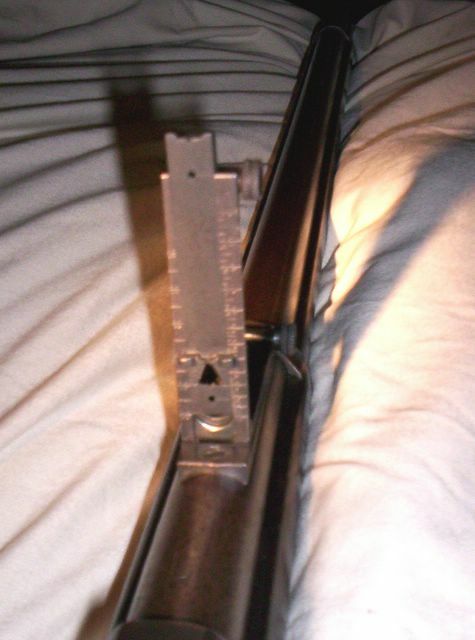 For detailed information on the history of this weapon and more photos, check out TrapdoorCollector.com. We were determined to fire this weapon. The cartridge it takes is still made today for modern rifles, but we did not want to use a modern load. Its smokeless powder could build more pressure than the Springfield Armory ever thought the gun would face. The factory knows owners may try to fire modern cartridges in old guns and they load most .45-70 cartridges a little on the soft side. We admit we could probably shoot modern cartridges from it, but our rifle is about 121 years old. We felt we should take it easy on the old codger. We went to a store that specializes in Cowboy Action Shooting and bought almost original specification black powder loads. 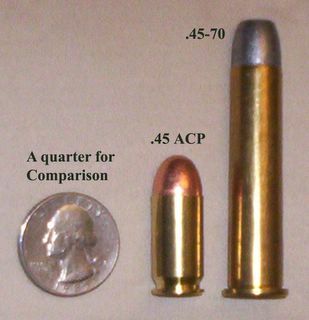 The cartridge is the .45-70 which means a .45 caliber bullet setting on top of 70 grains of black powder. 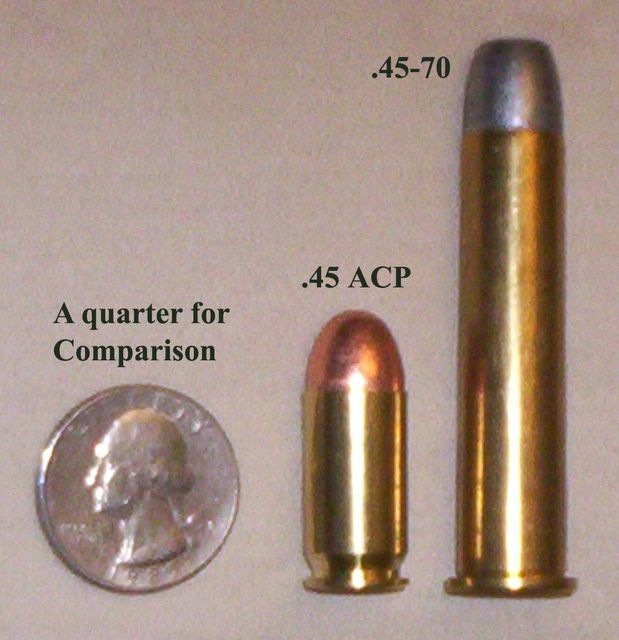 The service bullet weighed a whopping 500 grains (a common weight for a .45 ACP pistol bullet is 230 grains). The bullets on the cartridges we bought weigh in at 405 grains. We liked the cartridges we found since they would almost duplicate what long dead soldiers experienced when they first fired their new pieces on the training range. We fired a round and the gun proved a trooper. No signs of over-pressure, no hint of metal fatigue, just a satisfying billow of sulphurous gray smoke and a rather loud bang. Firing this gun is fun. There is no other description. Place the cartridge in and ram it home with a thumb, close the breech cover, aim, pull the trigger, lift the breech cover, and watch the cartridge spring out. Then repeat. It is simply fun. We had some trouble with the Buffington sight. Neither one of us has used it before although it is similar to other military sights. There are a number of peepholes, prongs, and every other possible sighting device built into it. Once we settled on which one we would use, we both found the gun is a tack driver. It was so accurate that it was a favorite rifle for competition shooting in the 19th Century. The military used the gun from about 1868 to 1899 with some overlap on both sides of the date range. It last saw action in the Spanish-American War. We don’t know if our firearm went to war or stayed home; the government does not keep records that detailed. We think it may have been assigned to Company B of the 33 rd Michigan Volunteer Infantry. Our firearm has a serial number in line with numbers on guns assigned to that unit. The record is sketchy though. It does have all the proper proof marks, inspectors cartouches, and other stamps the military loved to put on guns of this period. 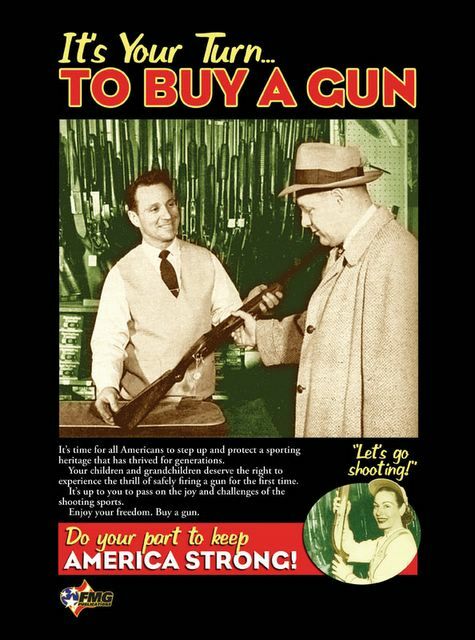 This is a fine gun and picking it up reminds both of us how far gun technology has come. We see later model trapdoors fairly often in gun shows and stores. If you want to shoot a true antique that is accurate, reliable and well built, you could do a lot worse by taking one home with you. Not only is it fun to shoot, it is a piece of living history, made in Massachusetts. UPDATE: 9:20 PM. Be sure to read Seth from Massachusetts' comments on this post. He adds more information in a greater detail than we went into. We welcome people to add their knowledge in the comments or talk about their experience shooting a similar gun. Only the earliest rifles were converted muzzleloaders. By 1870 they were made with a musket barrel, stock and lock but with a newly manufactured action. From 1873 on they were made new from the ground up with no leftover musket parts. The thing which amazes me about trap door Springfield is that there were so many of them. Remember this was an era in which the army had shurnk to almost non existance. During much of the 1870's and 80's, and right up to just before the Spanish Ameican War there were only 26,000 men in the entire United States Army (and in 1877 it took congress 5 months to argue over a defense appropriation, forcing the soldiers to serve without pay the whole time). And by the way, 1884 rod bayonets are rare, the vast majority of rod bayonets were 1888's. See Flayderman's Guide for an extensive listing of all the myriad types. The 8th edition I have in front of me now states that there were only about a thousand true model 1884 rod bayonets, but there are many 88's marked 1884! The difference between the 84 and 88 is in the latches which secure the bayonet. It was also the longest serving arm in American History. Examples were carried by many state guard units during World War One, and the very last unit to dispose of their trap doors was the Michigan National Guard in 1947 (thought the rifles had been in storage for a couple of decades and saw no use in that war). The cartirdge, however, remains in service. .45-70 blanks power the line throwing guns used by the Navy today. Completely confused now? Good, that's what makes gun collecting so interesting.